The students from the College of Arts and Sciences Student Advisory Council (CASSAC) are holding a book drive for Chicago Books to Women in Prison. Paperback books of any genre are welcome. This is a good time to do some spring cleaning of your bookshelves to support a good cause and to support our students’ advocacy work. Bins are available from April 8-19 in the Michigan and Wabash Lobbies and in CSI, WB 323. 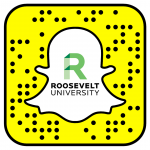 For more information, contact cassac@roosevelt.edu.